Hannover/Berlin. Germany is helping China to modernize its emergency rescue services under a long-standing and successful partnership that was taken to a new level a few days ago with the signing of an action plan for cooperation on healthcare during the China-Germany intergovernmental consultations in Berlin. The action plan includes rescue and emergency medical services. China and Germany plan to profile their cooperation, including this exciting new intergovernmental development, at a joint pavilion at INTERSCHUTZ 2015, the world’s leading exhibition for rescue, fire prevention, disaster relief, safety and security, which will be held in Hannover, Germany, in June 2015. The German side of the cooperation with China is spearheaded by the Björn Steiger Foundation under the joint medical directorship of Dr. Roland Huf, of Munich University Hospital (KUM), and Dr. Stefan Lührs, a noted emergency medical specialist. Dr. Lührs: “The cooperation project, which has now received official government blessing, is Germany’s biggest-ever bilateral cooperation project in the field of emergency and rescue services.” The Björn Steiger Foundation was instrumental in setting up Germany’s modern emergency rescue service. In terms of its involvement in China, the Foundation is responsible mainly for designing and structuring China’s emergency rescue service and for overseeing the provision of state-of-the-art technical equipment. It has already developed a master plan for modernizing and developing the country’s emergency rescue infrastructure with the aim of creating an integrated land- and air-based service modeled on the German system. The master plan will initially be implemented in two cities: Wuhan, the capital of Hubei Province, and Jieyang, Guangdong Province. Several German companies are playing a key part in the cooperative project and have already agreed to exhibit at the German-Chinese joint pavilion at INTERSCHUTZ. Among them are Airbus Helicopters, Daimler, Strobel, Volkswagen and Ziegler. Several of these firms already have branch offices in China, where their activities are creating jobs for local people. The modern rescue service infrastructure they are helping to build is also making the participating Chinese cities more attractive for foreign experts and investors. Germany and China have been working together closely in the field of rescue services and disaster relief for several years. 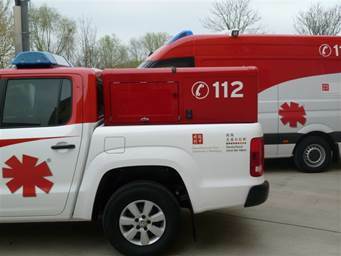 The cooperation is supported by Germany’s Ministry of Health, which in March this year hosted a high-level meeting at which the Mayor of Jieyang, Dong Chen, signed a Memorandum of Understanding on cooperation in the area of emergency rescue services. Mr. Dong Chen and his delegation of Chinese government and industry representatives also signed numerous economic agreements in the course of their trip to Germany. A statement from the Member States of the European Union decrees the redirection of more fundings to the countries most affected by the storm. Italian Red Cross sounds the alarm: "The Syrian crisis is a humanitarian catastrophe"
President of Italian Red Cross Francesco Rocca has issued a press release in which he appeals to diplomacy denouncing the dramatic situation that has been consuming Syria for over two years, especially affecting the most vulnerable amongst the population.